stock here--If you like this stuff, sign up as a follower on the right tool bar and be notified when new articles are posted. I am going on 5 weeks of focused solar work, so I won't be creating too much new material. So at least sign up as a follower so you will be notified when a new article is posted. Sometimes, playing what-if using spreadsheets is an easy way to test the plausibility of a hypothesis. For instance, there is fresh I131 radiation detected in Japan. I131 is created during nuclear fission, and it doesn't stick around long, its half life is 8 days, so in 80 days that is 10 half lives, of only (1/2)^^10 of it is left. One half to the tenth power, or 1/2 times itself 10 times. Try it, its a very small number. First one to post the answer gets a free gut flora Kimchee recipe, LOL. So the pro nuke minimalists have attempted to explain the I131 as a byproduct of "Medical Treatment". Review the spreadsheet. It should be totally clear that THERE IS ONGOING FISSION AT FUKUSHIMA. Ask if it doesn't make complete sense. pro-nuke trolls, please drop some inane comments to further marginalize yourselves. Hi Stock! Thanks - I want that recipe! How do I sign up as a "follower" ? Its on the right tool bar, by members, "join this site"
remember Tokyo measures their sewage after BURNING it instead of "dewatering" ( using centrifuge) so we will never know about Tokyo ever. I-131 burns off when burnt. 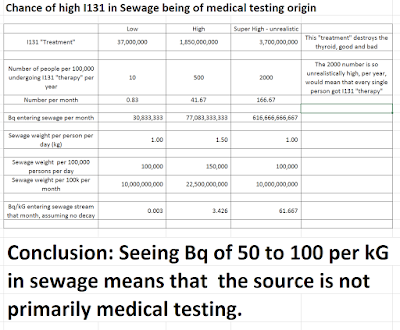 The very rare occasions that US measures I-131 in sludge, they also burn it instead of dewatering, so I-131 will never show up in US sludge ever, as well. If you want to hang with bo you are going to have to bird up, lol! Excuse me bo, I forgot I had already put the I131 info at that link but I know you can post lots of info and maybe the same. my mistake and I blame it on lots of posting tonight. Its crazy to be an activist, and not be fairly familiar with various social media. Stock, bo's info makes the half-life number really non-detectable I would guess. There is natural uranium in the ocean. Natural uranium has a finite probability of spontaneous fission. World class radiation detectors can pick up trace radiation levels that detectors 15 years ago could not pick up. Iodine is a fission product regardless of whether in an ocean or reactor. Wow, you really think you can get away with those half baked lies here? Lie 1) because there is radiation in the ocean, you can forget about the fresh fission radiation found in sewage. 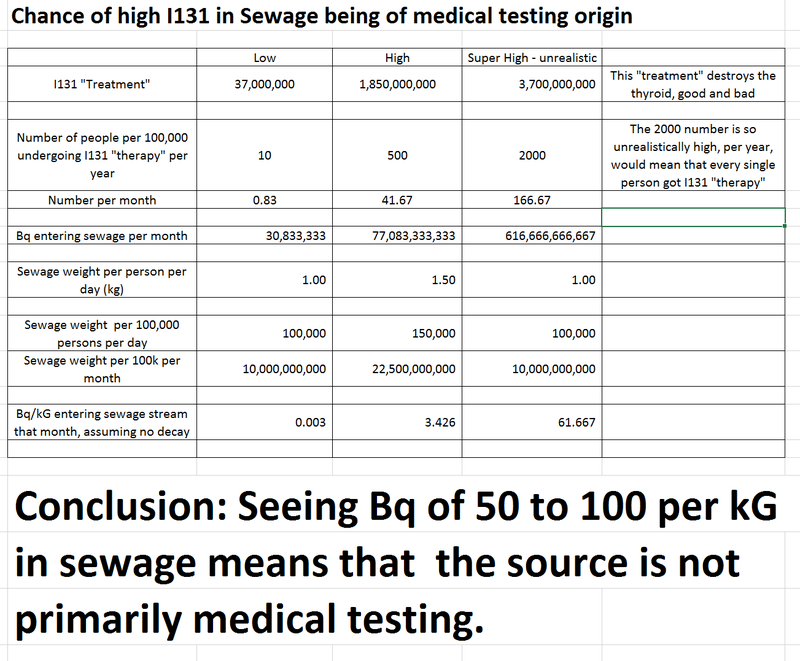 stock here, the I131 in sewage at those levels is from bioaccumulated fresh I131 from fresh fission in the underground coriums of Fukushima. duh. Lie 2) Detectors are so much better these days....its not that radiation has increased, its just that we are better at detecting it. I have been trying to spoon feed people about what happens when a nuclear reactor explodes and the end result no matter what anyone else says only to raise the alarm too high for people to believe. It wasn't sugar coated in the 60's when it was required learning what to do in an emergency, like a nuclear blast or an impossibility.....gasp...nuclear power plant melt-down! The blast sounded much better in realistic terms! But it was such new and cool technology! NOT! I think you will find that the average person understands a reactor and a bomb are different. Much hay is made here regarding Borax, and a moderated prompt crit however the explosion at Borax which btw was a deliberate test in the 50s, was a steam explosion and not a nuclear explosion from criticality. You should be careful to distinguish the two as I have admonished stock that the forensics dont support his assertion. Its typical though, like Caldicott using the Snopes hoax map that shows half of Hawaii dead two months after 311. Afterall that's the game, just get scare photos and videos up on YouTube. But trained nuclear engineers such as myself know better. It is all about education yet I dont rely on Enenews like antinukes. Thats the difference. You can 86 yer 185 boy, The EPA provided all the air sampling data, which I captured, Just in Honolulu, the uranium in air (only counting 234 and 238) was 2600% higher than normal. Guam was even higher. You are pretending to look for the smoke (185 MeV (and pretending it is not there) when the fire is right in front of all our faces....the uranium in air. Your disingenuous is not lost by my read. Duck and Cover, oh yeah, real effective. If the 185 keV is not there, then uranium is not there. Read Gilmore. You have the book. Or did you just copy the cover and other things from Amazon.com? Just like the absence of neutrons that debunked your moderated prompt criticality for Fuku 3, the absence of 185 keV in gamma spec means no 235U. Natural U is 7/1000 235 so in nature I would not expect a significant signature. However at 5% in UO2, its a tell tale sign if its from a reactor. What is the 235U/238 ratio in the gamma spec? Ask your citizen scientist buddies. I still have more game. You cant evade the truth when I debunk your theories. Hitchens's razor is an epistemological razor which asserts that the burden of proof in a debate (the onus) lies with whomever makes the (greater) claim; if this burden is not then met, the claim is unfounded and its opponents do not need to argue against it. As a Catholic apologetic, I understand that the matters of faith are different than matters of science. It seems you put your faith in junk science, just like all the other antinukes. Jet setting nukist is in our nation's capital. I kind of like Occams Razor, being the simplest explanation is almost always the truth. But I flip your argument on it's head....your assertation that Fukushima did not aerosolize tens or hundreds of tons of uranium and it's merry band of isotopes, is incredulous, and thus the burden of proof is on you. So, please present the gamma scint graphs and relevant collection data, you got my email, use it. Or post to Box or any of those services. Mahalo for your anticipated cooperation. Say Hi to Obama for me, or to Gina McCarthy, they are at the top of my lists.